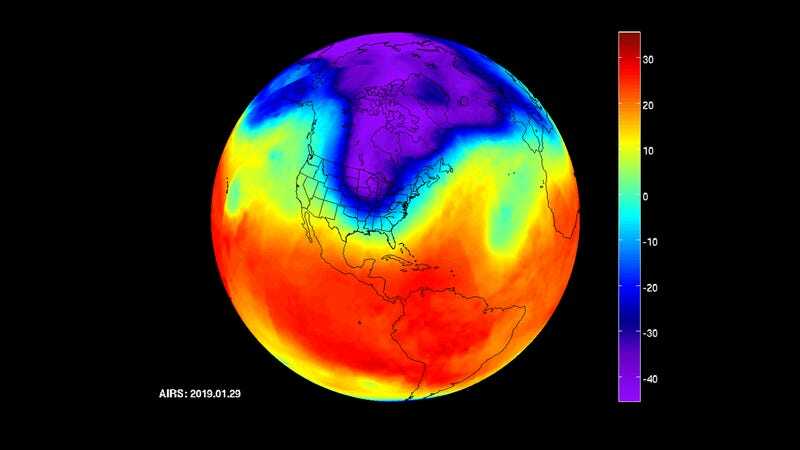 The polar vortex can actually refer to either one of a stacked pair of air masses: one in the lowest part of the Earth’s atmosphere or troposphere, and another on top of it in the stratosphere, both rotating counterclockwise. The lower vortex is a spinning, low-pressure airmass that exists all year, and the upper one exists in the winter, according to this recent paper. The jet stream is a band of wind that defines the boundary between the troposphere’s polar vortex and the warmer airs south of it—the shape of the polar vortex. When warm air pushes northward, it can pinch and push some of that arctic air south, producing the incredible cold temperatures we saw this week. The stratospheric polar vortex is usually tighter and more confined around the poles—we don’t deal with it much. But when it gets disrupted or weakens, it can have a subtle influence on the troposphere and potentially help trigger cold snaps. The relationship isn’t direct, though, according to the paper. Since the behavior of the polar vortex deals primarily in how heat flows in the atmosphere, you might wonder if climate change has anything to do with it. Scientists have suggested that a decrease in sea ice and less snow in the Arctic as a result of human-driven warming has caused a weakening of the stratospheric vortex, or that it’s caused the jet stream that defines the edge of the tropospheric polar vortex to meander further south, leading to more cold air outbreaks at mid-latitudes. But all of this is still up for debate. The AIRS map only shows the temperatures, rather than the air masses themselves. But it should give you an idea of this process in action, as well as the intense science required to understand these weird natural events.